I used to dream of the day when I’d no longer need to drive my kids around. Now that it’s almost here, I’ve begun to think about what I am losing. I’m not only losing early-morning wake-ups and late-night pick-ups; I’m also losing precious time with my children. While I maybe didn’t enjoy driving to and from practices, games and sleep-overs, I was with my children, and I had their attention. We were each other’s captive audience for the few minutes we spent on the road together. It’s harder to get those moments now. My daughter, my youngest, is now learning to drive. Like her older brother, she will soon have a school permit that will allow her to drive to and from school events. No longer will I be with her when she leaves the house for an early-morning practice or waiting for her when the bus drops her off after an evening event. I have to admit, having my son drive himself for the past two years has been tremendously convenient, and that convenience probably blinded me to what I was missing – time to catch up with my kids, to learn about their activities and interests, to meet their friends. I made the mistake that many people make – I wished away part of the life I was given. Wishing away life’s activities is mining for fool’s gold. Unfortunately, by the time we realize this, it’s too late. We might get what we were looking for, but we might wish that we had back what it cost us. Maybe we’re convinced that we can start enjoying life once the mortgage is paid off and the kids are through college, not realizing that we’ll never get back the time we spent wishing and waiting for those things to happen. Maybe we can’t wait until we can quit our jobs and do something we really like, not realizing that the job we don’t like is setting us up for an opportunity we haven’t even imagined yet. Maybe we’re counting days until our child’s sports season is over, not appreciating all that she is learning from participating. When my kids were young, I remember thinking that it would be so great to have the entire house to myself for even just a little bit of time. I wouldn’t have to worry about anything or anyone except myself. Now, I often find myself alone in my house, wishing that I was still central to my kids’ lives. Likewise, I rushed through college, thinking that something better was on the other side. Because I was tired of living on little money, I focused on graduating as quickly as I could – cramming as many credit hours as possible into each semester. When I wasn’t in class, I was working so I could afford all of those credit hours. I was only on campus to attend class, never getting involved in extra-curricular activities that can enrich the college experience. I achieved my goal of graduating from college in four years, without debt and with a teaching job already lined up, but a year later, I was wishing that I was back in college – that I had spread out my experience and took advantage of unique collegiate opportunities. Like driving my kids around, I was too focused on the destination to enjoy the journey. Life is like that. 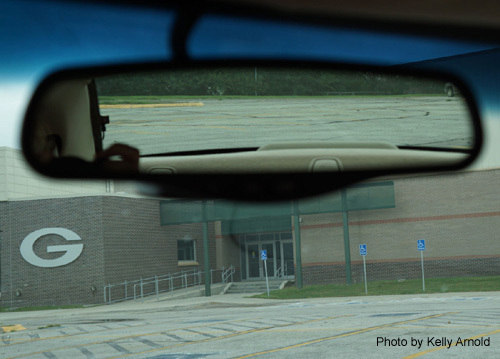 As the destination begins to fill our windshield, we also start to see more clearly through the rearview mirror. The sooner we can figure this out, the happier we will be. This entry was posted on September 14, 2015, 6:24 am and is filed under Motivation. You can follow any responses to this entry through RSS 2.0. You can leave a response, or trackback from your own site.